Fourteen-year-old Jess wants to go on holiday this summer like any other teenager, but she has to be on hand to help to care for her brother. 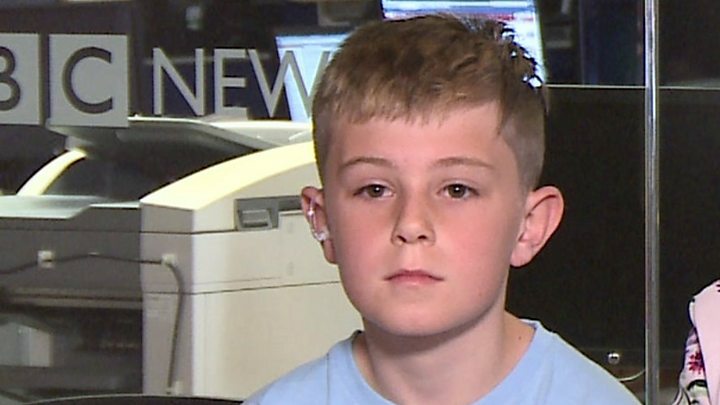 Jacob, 13, has quadriplegic cerebral palsy and is registered blind so needs care 24 hours a day seven days a week in his home in Carlyon Bay, Cornwall. "My mum and I take it in turns being with him around the clock," says Jess. She is just one of 700,000 children and young people caring for someone with a disability or an illness in the UK. 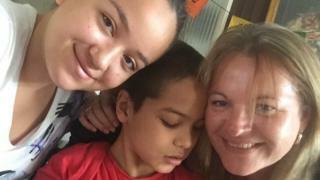 The summer holidays are very different for people such as Jess Siagian, and her mother, Natalie, as they are the sole carers for Jacob. They cannot leave him alone at all because he is blind, as well as severely disabled, and he gets very distressed. Natalie says: "He's very reliant on his loved ones to interpret the world around him." The only let up they get is five hours every Saturday when a professional carer takes over - but at the moment the carer is on holiday. Jess and Natalie have to do everything for Jacob, starting with getting him out of bed in the morning, giving him a bath and dressing him. "I dread the extra hours I have to do in the summer holidays as it can get very boring at times," says Jess. It's hard for them to go out as a family - let alone on holiday together. "So, we end up staying at home a lot. It can get a bit frustrating. "Even if I just need a lift to go and see my friends, we have to get Jacob into the car. "We have to do the whole ramp thing and my mum has to drop me off. "Then my mum has to get him out of the car when she gets back, so I don't want to ask too much of her." "I spend most nights face-timing with friends to stay in contact rather than meeting up." A snapshot survey of 270 young carers by charities the Carers Trust and Action for Children found nearly half (47%) would spend more than four hours a day during the summer holidays caring for a relative. And most (57%) worried about talking to their friends when they returned to school after the summer break. Natalie says: "Normally, I try and keep Jess protected from the caring responsibilities as far as possible but she knows no time of not caring for Jacob. "Because it weighs heavily for me, I miss spending the time on Jess - and I know it's missing. We've never been on a summer holiday together." But Natalie is planning to take Jess away camping for a couple of days, if she can work it out, when the carer comes back. "We're not grumbling," she says. "It is what it is. There's no point getting worried about it because you can't change it." Carol Iddon, Action for Children's managing director of children's services, said: "The summer holidays can be heartbreaking for young carers who are often isolated and trapped at home, while their friends are having fun in the sunshine, playing sports or enjoying adventures abroad. "We see first-hand the awful impact of loneliness and stress on young carers, who dedicate their lives to helping their loved ones. "These children are often desperate for a break from their duties and to have a bit of fun in their holidays - that's why young carer respite services are such a lifeline for them."